After an extensive period of play on LottoDay.com we have come to the conclusion that we love them! With an easy to navigate website, officially scanned tickets, and 100% cashback bonus on our first purchase, we couldn’t be happier. When you first visit LottoDay it’s clear they take a straightforward approach to its website layout. You can go from the homepage to having a purchased ticket in less than three clicks, or 3 taps if you’re on mobile. That’s right, LottoDay is fully responsive on mobile too. Additionally, if you’re an Android user, you can download their native app. As soon as you open the homepage, you’re presented with the biggest Jackpot available at that moment in time. The results page is only a single click away too. Scroll down a little further, and you’ll see some of the websites overall stats, including the total number of winners, amount of winnings and how many tickets sold! 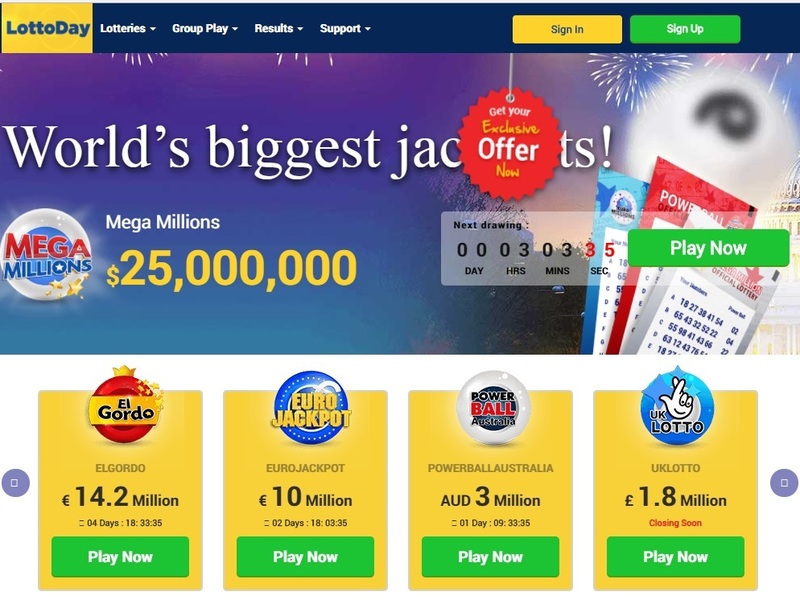 LottoDay offers 8 of the most popular and biggest lotteries in the world. These include El Gordo de la Primitiva, Euro Jackpot, Euro Millions, UK Lotto, Mega Millions, Powerball, Ozlotto, and Power Ball Australia. You can choose to play the games either as single purchase tickets, or Group Play (syndicates). In Group Play, you get to purchase tickets as part of a group. When buying as a group, you’re given much better odds of winning, as well as more tickets for a fraction of the cost. Best of all, you don’t even have to find friends to create the group, it’s all automatic. 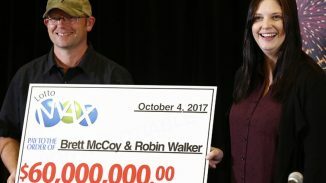 LottoDay is one of the most straightforward online lottery services available, and that sentiment rings true with its payment options too. You purchase tickets using some of the most popular methods available today, Credit/Debit card, EntroPay and NETeller. LottoDay gives you multiple ways to save money when you purchase. Standard discounts range from 5% all the way up to 20% when you buy a subscription. Lastly, LottoDay doesn’t charge any hidden fees with regards to your winnings, so you can virtually keep it all. On top of this, LottoDay is constantly running offers, discounts on tickets, buy 1 get two free, cashback bonuses and more. These are usually communicated with the player through email and on site. Getting in touch with a member of the support team at LottoDay was surprisingly easy. They have three main ways of getting in contact, email, live chat or telephone support. We found that there was no waiting queue either when we called the support line. We asked a few standard questions, most of which the answers were already readily available on their extensive FAQ, and the support team knew their stuff. LottoDay’s design is simple, and it’s in that simplicity that you can very quickly purchase your tickets last minute with ease. The ability to subscribe to your chosen lottery too takes out the need to remember to play every week. Lottery results are always updated shortly after the draw, and you’ll always receive an email confirmation if you have any winnings.